You will see standard ‘PHP Info’ page with values of different PHP configuration parameters. Check display_errors parameter value under ‘PHP Core section’ now. 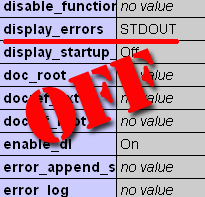 If you see STDOUT as on the image from the left or ON values and error_reporting parameter below is not equal to 0 or OFF this vulnerability exists on your site and thus, you have to resolve it. Now lets check it in action how bad guy can get information about your WordPress installation absolute path. Everybody can get WordPress installation package. Everybody knows what files and in what folders are placed in that package. So we just call WordPress files directly by name while get the result we wish. I stopped on the wp-settings.php file. Type in the browser address field this URL http://yourBlogURL/wp-settings.php Do you get the same error message as me (I made my test with last WordPress 2.8.4 version)? 1st: PHP running as CGI (CGI). 2nd: running PHP as an Apache Module (Apache 2.0 Handler). php_value error_reporting "0" php_value display_errors "OFF"
Look at the ‘Server API’ line at the top of the ‘PHP Info’ page to define in what mode your hosting provider execute PHP. Not all directives are changeable/installed. If you have made a change in php.ini and it is not working correctly, contact your shared hosting provider technical support for more information. You will need a php.ini or .htaccess file in every directory for which you want the changes to apply. Do not forget about wp-content/plugins folder an its subfolders. Some plugins shows paths in the error messages also if your make direct call to its files. It is right practice to fully turn off all PHP error messages at the live site. It is better to put your PHP error log file somewhere beyond of your site root in order it will not be accessible to your site visitors. For more information about php.ini directives you can visit this php.net link. And remember – “Silence is golden”. 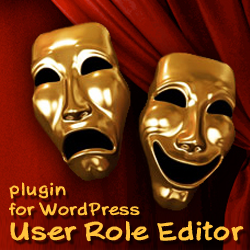 This entry was posted on Sunday, September 6th, 2009 at 06:02	and is filed under PHP, Security, WordPress. You can follow any responses to this entry through the RSS 2.0 feed. You can skip to the end and leave a response. Pinging is currently not allowed.